Nothing says summer like a trip to the beach, especially for families. But not every beach caters to the unique needs of those traveling with children. That’s why each year, we choose the best of the best beaches for families specifically, ensuring each U.S. beach that makes our list offers the important amenities families seek—lifeguard protection, easy access to restrooms and showers, and local attractions, restaurants and hotels (because yes, everyone will need a break from the sand and surf at some point). 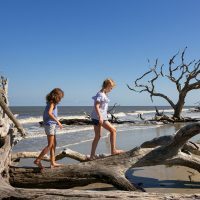 These are the best family beaches for 2019.
Insider Tip: Kids as young as 5 can learn to surf with Girl in the Curl Surf Shop, located steps from the sand. Students will learn the basic elements of surfing and gain the confidence needed to pursue surfing on their own. “Everybody’s gone surfin’… surfin’ USA.” Listen closely to the Beach Boys hit and you’ll hear them sing about Doheny Way, a reference to Doheny State Beach. And if the Beach Boys think Doheny State Beach is a great surfing spot, can we even argue that? This state park beach was practically made for new surfers, with waves that are just the right size for beginners. Camping facilities are available close to the beach, or you can stay at a luxury resort (Ritz-Carlton) or budget-friendly hotel (BEST WESTERN) nearby. Insider Tip: While you’re at the beach, locate a Navarre Beach Ambassador, who will teach kids about the area’s resident sea turtles, beach flag safety, and more. Navarre Beach is nicknamed “Florida’s Most Relaxing Place”—how’s that for a beach vacation destination? This hidden gem is the perfect spot to catch calm waves and build sandcastles. But before you start constructing your masterpiece, check out the Borrow Bin, where visitors are encouraged to borrow and donate shovels, buckets, and other beach toys in an effort to recycle and preserve the local environment. Navarre Beach also offers two aquatic beach wheelchairs, available on a first come, first served basis at no charge. 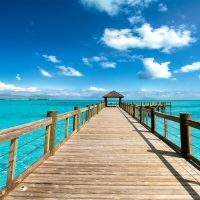 While you’re in town, get to know the locals at the Navarre Beach Sea Turtle Conservation Center and Navarre Beach Marine Sanctuary. Insider Tip: A 15-minute bike ride will get you to Grayton State Beach Park, where you might witness an “outfall” at the coastal dune lakes. This rare geographical phenomenon (found in very few parts of the world) happens when heavy rain or strong waves cause a breech in the sand between the lakes and the Gulf of Mexico, forcing water to spew back into the ocean (think of Old Faithful in Yellowstone). 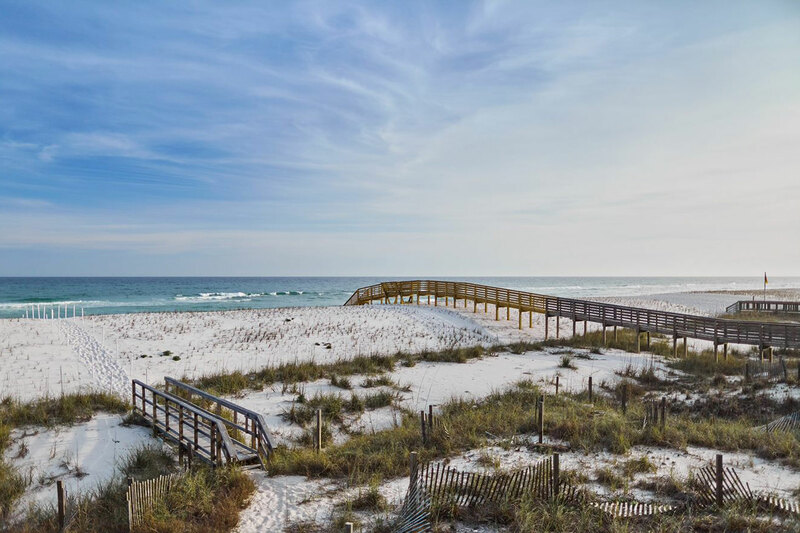 There are so many beach access points along the 26 miles of shoreline in South Walton, Florida. But Seaside Beach makes our list for its convenience and overall atmosphere, both on and off the silky, sugar-white sand. Grab a gooey grilled cheese sandwich or frozen custard at one of Seaside’s food trucks, take in a kid-friendly show at The Repertory Theater, visit the Seaside Farmers Market on Saturdays, and stroll down Nachez Street to snap a photo of the Truman House featured in The Truman Show; the 1998 movie was filmed in Seaside. Then make your way to Central Square, where you can browse boutique shops and purchase snacks and drinks at Modica Market before heading back to the beach. Insider Tip: Get a CAN (Champion Autism Network) Card, which acts as an easy way to tell staff at local establishments that you’re traveling with someone on the autism spectrum. You can skip the lines at some often crowded places such as the Myrtle Beach SkyWheel—no questions asked. In 2016, Surfside Beach—part of the Myrtle Beach area’s 60 miles of coastline—became the world’s first “Autism-Friendly Travel Destination,” thanks to local mom and founder of the Champion Autism Network, Becky Large, who worked with area attractions, restaurants and hotels to ensure staff could accommodate visitors with special needs. Surfside Beach has three wheelchair access points (3rd Ave. N, Surfside Drive at Surfside Pier and Melody Lane) and complimentary wheelchairs are available via the Surfside Beach Public Safety Department. When it’s time for a break, check out Wild Water & Wheels water park or drive a few miles down the road to the City of Myrtle Beach, another autism-friendly beach town. 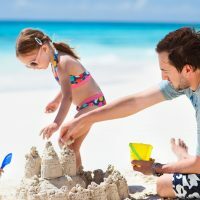 Insider Tip: Contact the “Sandcastle Guy” (Mark Landrum; sandrum.com), who will teach you the tips and tricks needed to build the ultimate sand sculpture. 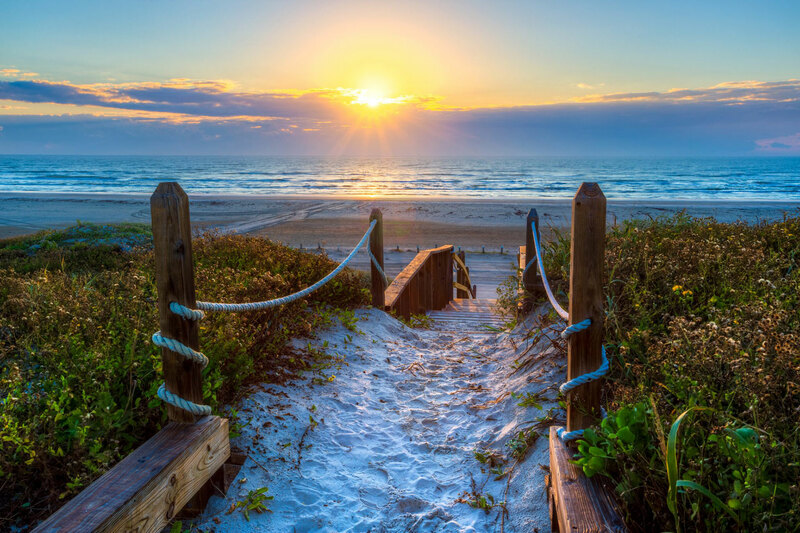 Located on Mustang Island—an 18-mile barrier island on the Gulf Coast of Texas—Port Aransas Beach is a popular place to go camping (with a permit, available at local stores for a small fee) and build bonfires at night. Driving on the beach (in a designated area) also means you don’t have to cart your beach tent, chairs, toys and kids too far! Following destruction from Hurricane Harvey in 2017, Port Aransas is on the upswing with so much for families to explore beyond the beach. Known as “The Fishing Capital of Texas,” Port A offers plenty of opportunities to drop a line, and other highlights include the annual Texas SandFest in April, pretending to be pirates on Red Dragon Pirate Cruises, and spotting dolphins via The Scarlet Lady Dolphin Adventure tours. Insider Tip: West Lake Beach offers a separate, shallow swimming area for little ones. Among the many lake beaches in Iowa (yes, Iowa) is West Lake Beach. This beach offers every single amenity families seek (and then some): a wide, sandy area; swimming; complimentary beach chairs; a snack stand; shaded picnic area; lifeguard protection; and showers and restrooms. You’ll also feel good knowing the lake water is tested weekly. When it comes to accommodations, you can go camping close to the beach or choose a hotel in downtown Davenport, about 20 minutes away. Insider Tip: “Sundaes in the Park” are held weekly at Northside Park. The event starts at 7 p.m. with a free concert, special children’s entertainment and fireworks to cap off the night at 9 p.m. 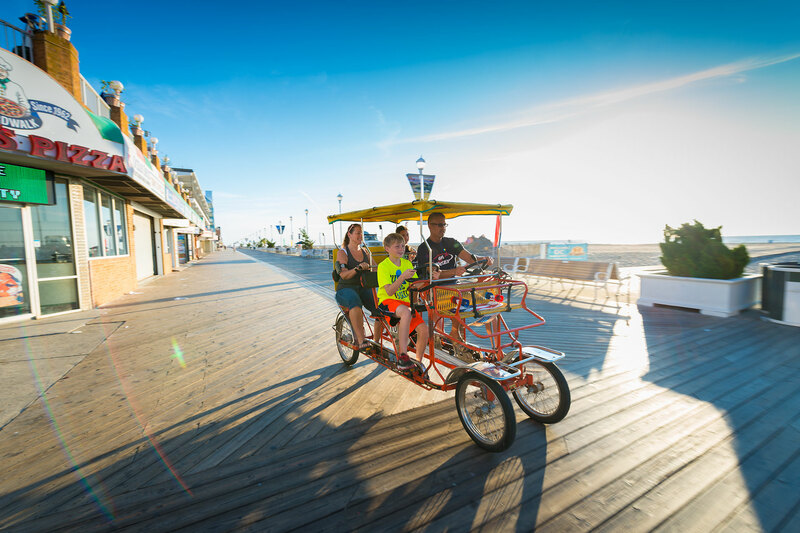 Ocean City, Maryland, is a longtime favorite for families, with great surf, water sports rentals, an abundance of oceanfront resorts and vacation rentals, and a boardwalk that can’t be beat. The boardwalk features classic amusements at Trimper’s Rides and Amusement Park (and just off the boardwalk, Jolly Roger Amusement Park), and delicious boardwalk eats include pizza at The Dough Roller, ice cream at Kohr Brothers Frozen Custard and, most famous of all, Thrasher’s French Fries. Nearby, check out the Ocean City Life-Saving Station Museum, which offers free family programming at 10 a.m. Monday through Saturday. Insider Tip: Walk the scenic, 1-mile Marginal Way to Perkins Cove, a quiet fishing village with restaurants that range from lobster shacks to fine dining. Ogunquit, Maine, encapsulates the charm of New England, with a beautiful beach and darling downtown among the highlights. Ogunquit Beach’s tidal pools are especially fun for young kids to splash in, and the wet, packed sand is prime for sandcastle building. When the tide rolls in, pack up and head to Bread and Roses Bakery for a sweet treat or see a family-friendly show at the Ogunquit Playhouse. The area offers a variety of resorts and vacation rentals, many of which book up at least a year in advance with repeat guests who have made Ogunquit Beach a family vacation tradition. Insider Tip: Get to the beach before 11 a.m. to nab a parking spot. You might recognize Cannon Beach from The Goonies, Twilightand our list of the 10 Best Family Beaches in 2014. This Pacific Northwest favorite is known for its towering Haystock Rock, where—at low tide in April through mid-May and late-June through July—you can spot Tufted Puffins from a distance (bring your binoculars). Cannon Beach is also known for its annual sand castle-building contest in June. Springfor an oceanfront resort or rental to enjoy the views and when you get hungry, head to downtown Cannon Beach for kid-friendly restaurants and breweries. Insider Tip: Encourage your family to conquer the “3 Dune Challenge,” in which you climb up the park’s three tallest sand dunes (and are rewarded with amazing views—including the Chicago skyline in the distance). Indiana Dunes National Lakeshore became the 61stnational park in the U.S. earlier this year, deeming it a worthy vacation destination for any family. What’s more is the park offers a beautiful beach, with 15 miles of shoreline for lake swimming and sunbathing. Visitors can also fish, bike, hike and explore Bailly Homestead and Chellberg Farm, two historic sites within the park. In nearby Valparaiso, Indiana, catch a double feature at the 49-er Drive-In Theater and enjoy an ice cream cone at Valpo Velvet Ice Cream, serving the creamiest custard around.